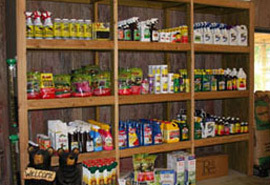 Cedar Creek Nursery carries a complete line of disease and pest control products to help keep your lawn and garden healthy and beautiful. 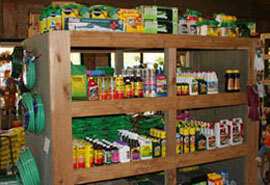 Our staff will assist you in selecting the best product for your pest or disease problems. We will recommend maintenance strategies to help keep problems from reoccurring. We are proud to carry Fertilome and HiYield products, as well as a complete line of organic products. Many varieties and sizes of shrubs, flowering trees, evergreens, annuals, and perennials gives us a large selection for our customers to choose from. Whether you know exactly what you are looking for, or just need a few ideas, Cedar Creek Nursery is here to help.